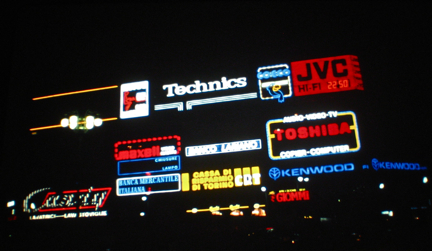 It might look good at night, and rather cosmopolitan at that – shades of Tokyo, Times Square, Vegas – but remember the context – directly opposite the Duomo! 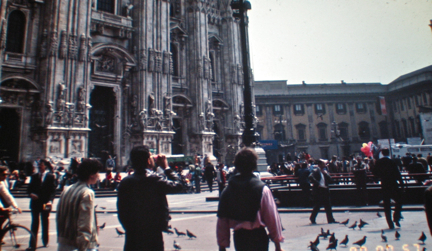 Not the best of introductions, but neon lighting aside, the Piazza Duomo, the heart of ‘gran Milan,’ the self-described cross-roads of the world, on Saturdays and Sundays attracts a milieu representing a cross-section of the city. And that cross-section is of the world today, reminiscent of yesterday’s Italians from other regions. 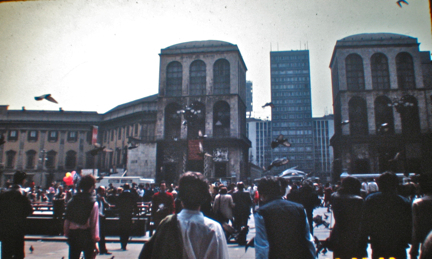 Today’s Milanese have come from everywhere, and have settled in this metropolis, which keeps outgrowing itself in concentric circles in the shadow of the Madonnina. The Palazzo Reale (Royal Palace) can be seen to the right of the Duomo. It was partially demolished to make room for the nave of the Cathedral. This is the Palazzo Reale, as seen across the Piazza Duomo. Francesco Sforza did some refurbishing in 1452, on what had originated as a “city hall” in Milan, later becoming a noble residence during the rule of the Torriane and Visconti families. It was used by the Spaniards during their reign. 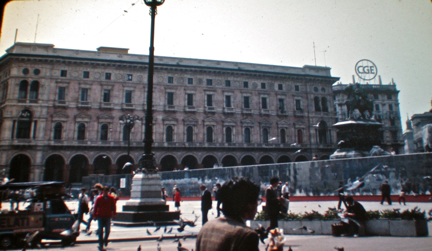 This is the Arengario, a twin structure facing the Piazza Duomo. This is described in local literature as the “seat of the Palazzo del Turismo.” The twin towers were designed in 1939, but not completed until 1956. 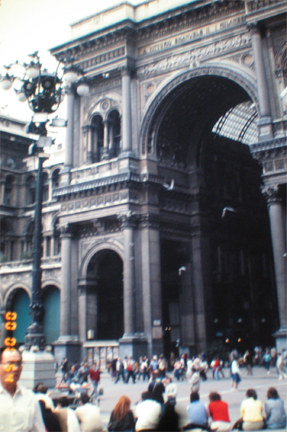 The architects were Enrico Agostino Griffini, Pier Giulio Magistretti, Giovanni Muzio and Piero Portaluppi. Finally, the Galleria Vittorio Emanuele II, an extraordinary enclosed gallery of shops, the floor plan of which is in the shape of a Greek cross (a fact completely overlooked by just about everyone). It is important to note that so many cities in Europe do have places for their citizens to congregate, usually centrally located, accessible by many modes of transportation – places for people to gather to celebrate, to mourn, to cry out, and to applaud. Without such spaces, identifiable with people, cities wither, burn, and die. A closing comment: Mark Twain is quoted as calling the Duomo: "a poem in marble."